The effects of the storm were felt across a huge swathe of coast that would span the distance between London and Berlin, although not all areas were badly hit. 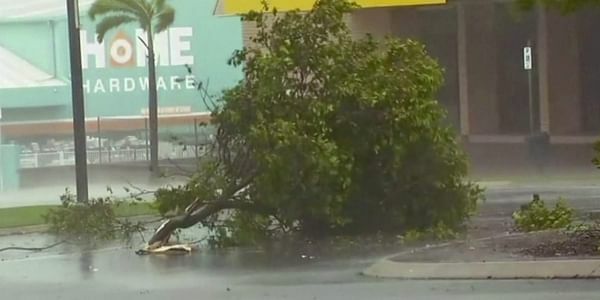 AYR: A "monster" cyclone smashed into northeast Australia Tuesday, cutting power, damaging buildings and uprooting trees, with coastal residents battling lashing rain and howling winds. Great Barrier Reef islands popular with foreign tourists were battered by the category four storm which slammed into the coast of Queensland state with destructive wind gusts of up to 270 kph (167 miles) near its broad core. There were fears its arrival would coincide with early morning high tides and cause severe flooding, but it slowed before making landfall between the towns of Bowen and Airlie Beach in the early afternoon. By early morning Wednesday it had been downgraded to a tropical low system. At least one person was seriously injured, but the extent of damage was not expected to be known until daybreak with conditions too dangerous for emergency crews to venture outside despite hundreds of calls for help. "At first light tomorrow, we'll be sending people in to do a rapid assessment of the damage," said Queensland Premier Annastacia Palaszczuk, with flash flooding and still powerful winds making it hard to do this at night. "Everyone is going to be in shock tomorrow, just to see the full impact of this cyclone. I'm bracing myself for it." The federal government said it was on standby to help with the clean-up, with soldiers, helicopters and planes ready to mobilise. "It felt like we were underneath a freight train for most of the night, strong bass rumbles as the... wind rattled past and made the buildings shake," Cameron Berkman, who is holidaying on Hayman Island, told the Australian Broadcasting Corporation. Queensland politician Mark Ryan said it was also chaotic at Airlie Beach, the mainland holiday gateway to the Whitsunday islands. Queensland Police Commissioner Ian Stewart said there was "certainly structural damage", and at least one person had been badly hurt by a collapsing wall. "I think the public and the community of Queensland need to understand that we are going to get lots of reports of damage and sadly I think we will also receive more reports of injuries, if not deaths," he said. The Bureau of Meteorology, which forecast up to 50 centimetres (20 inches) of rain, urged people to stay calm but not be complacent. Palaszczuk, who called the storm a "monster", said at least 45,000 homes were without power with communications down in many areas and hundreds of schools and childcare centres closed. People sandbagged and boarded up homes after warnings to prepare for the worst weather to pummel the state since Cyclone Yasi in 2011, which ripped houses from their foundations and devastated crops. Yasi, which struck less populated areas, caused damage estimated at Aus$1.4 billion. Debbie has officially been declared a catastrophe by the Insurance Council of Australia, allowing them to prioritise claims from the disaster. Some 3,500 people were evacuated between the towns of Home Hill and Proserpine, around 100 kilometres (62 miles) south of Townsville, a tourist hotspot and access point to the Great Barrier Reef. Another 2,000 people in Bowen also moved, officials said, with many camped in cyclone shelters. Up to 25,000 more in low-lying parts of Mackay headed to higher ground. Farmer Anthony Quirk's main concern was for his 150 hectares of mung beans.